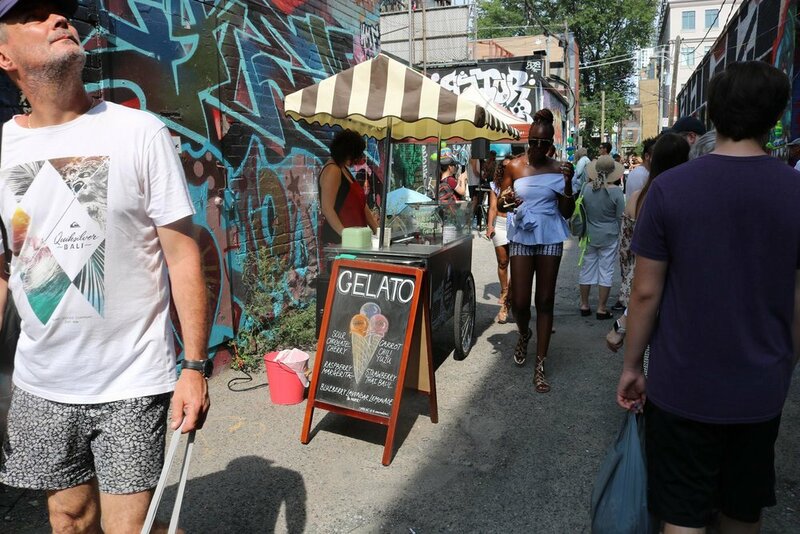 As part of an on-going Light Up the Laneways project, the Laneway Project hosted two community visioning and fundraising events at the project’s Ossington and Bloordale sites. #LightUptheLaneways is a demonstration project that is making laneways friendlier and more accessible to pedestrians and cyclists through the use of solar-powered, shielded LED lights to provide ambient illumination. Alongside the community visioning component of the evening, where community members and members of the local Ossington BIA shared their thoughts regarding the placement and arrangement of lights, the events brought these laneways to life with food, drink, games and art. As the project progresses, The Laneway Project hopes to install LEDs in two west end laneways as a demonstration model other communities can look to as they think about how to transform their own laneways. On August 5th, the Layers of Rush Lane party took over Graffiti Alley for its third year. With food and drink, art, live music and games on a beautiful summer afternoon, it was unsurprising that the public space was quickly filled with laneway lovers from around the city. Whether they came specifically for the festival or simply happened upon it, everyone was keen to enjoy a drink and a bite to eat, and celebrate the joys of play in this pop-up backyard. This annual laneway event enhances the The Laneway Project’s impact by showcasing how even temporary uses can yield dynamic, inclusive and vibrant public spaces. In late September, The Laneway Project and Danforth Village residents came together to transform a network of laneways using greening, art, and lighting. Over the course of a few weekends, the team of volunteers installed raised garden planters and trellises to house community gardens of native vegetation along the laneways. Adding vegetation to these back alley spaces provides a host of benefits, both aesthetic and ecological, softening and beautifying while attracting valuable pollinators. Alongside the greening efforts, more than 20 artists painted a series of laneway murals on adjacent walls, fences and garage doors, adding eye-catching colour to brighten up the area. These improvements were supported by Section 37 funding from nearby condo developments, setting a new precedent for the use of these community benefit funds. In addition to the physical improvements, one of the laneways was officially named Luttrell Loop Lane, in commemoration of its former role as the eastern terminus of the Danforth streetcar line, before it was decommissioned in 1968 with the arrival of the Bloor-Danforth subway line. The commitment of local volunteers to enhancing this network of laneways offers another telling example of Torontonians seizing the opportunity to claim new spaces for living in our city. The act of naming reclaims the space while embedding a knowledge of the past and a commitment to the ongoing use and care of the space by the community. 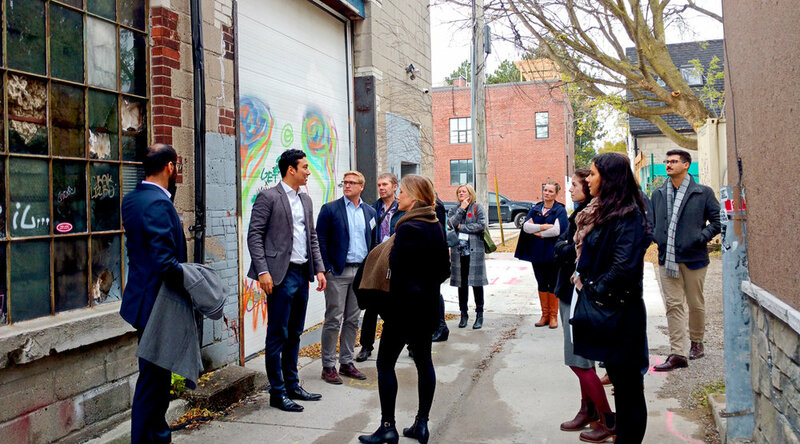 On November 7th, Executive Director Michelle Senayah led a group of urbanists on a tour of several planned and completed laneway revitalization projects around the city. Participants learned and shared experiences about how Torontonians — residents, BIAs, developers and City staff — are transforming our laneways to recapture these neglected parts of our public realm as the city grows and intensifies, using public art, greening, paving and laneway-oriented residential and commercial suites.